How Interac and Canada online casino goers prevent fraud together. The vast majority of Canadian adults use Interac to secure their purchases. 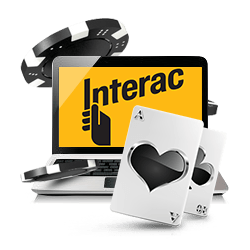 Whether swiping a physical Interac Debit card at a retail location, or utilizing Interac Online at offshore gambling websites, Interac has become Canada’s most trustworthy source for facilitating non-cash payments. One of Interac’s finest selling points is its cutting-edge security measures. Every transaction is under the protection of state-of-the-art technology and impenetrable data encryption. In fact, they’re so confident in their security protocol, they extend a Zero Liability program to all customers. The concept is simple. If fraud occurs by “circumstances beyond your reasonable control”, Interac will take 100% liability for reimbursement. It’s not just fraud they’re protecting you from. The program also reimburses losses due to system malfunctions or technical errors. What they’re essentially saying is that if something goes wrong, resulting in the loss of money during an Interac Debit, Interac Flash, or Interac Online fund transfer, and you could have reasonably prevented it, you’re responsible for it. If not—if the circumstances were beyond your control—they’ll take the bullet and reimburse 100% of the losses. So, the real question is this… What constitutes “circumstances beyond your reasonable control”? Interac offers consumers a wealth of advice geared towards fraud prevention. There are three primary ways users can help ensure the safety of their personal and financial information. They include recognizing and avoiding phishing scams, protecting your PIN, and utilizing Interac Flash for mobile retail purchases. A phishing scam is a scam in which the perpetrator attempts to get sensitive information, like name, address, date of birth, SIN, bank accounts, logins and passwords, etc. Interac suggests extreme caution if you receive a deposit or money request you did not expect, or from a sender you don’t know. Do not reply to the email, or click any links or attachments therein. Instead, contact the sender via a different, reliable channel, and ask if money was sent or requested, and why. Look over the text for errors, such as typos or bad grammar. The company name may be spelled wrong, punctuation may be off, or the dollar sign ($) might be after the amount instead of before it (45$ instead of $45). Forward the email to phishing@interac.ca. Their fraud team will investigate. If you suspect you are the victim of a phishing scam, and filled out information on a web page after clicking an email link, change your online banking password immediately, then contact your bank. Interac Debit cards utilize built-in chip technology to provide superior security against a range of known fraud tactics. So long as no one else has your PIN, your card is safe from fraudulent use. Do not share your PIN with anyone, ever, for any reason. If you must, for whatever reason, change your PIN afterwards. When using an ATM machine, shield the keypad while entering your PIN. If something seems off about the transaction process, trust your instincts. Cancel the transaction and use a different ATM machine. Always remember to take your Interac Debit card with you when you leave. Review your bank statements for any suspicious transactions. If you find anything out of the ordinary, or believe your debit card has been compromised, contact your bank immediately. The best way to protect your debit card is not to use it in person. 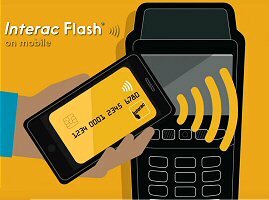 Instead, your mobile phone can act as your debit card with Interac Flash for mobile. This prevents increasingly common debit card scams, like skimming, transaction replay and electronic pick-pocketing. To use it, link your Interac Debit to the Interac Flash app. When making a purchase at a retail location, simply open the app and hold your mobile phone an inch or two above the payment kiosk. The transaction completes instantly via secure data processing.